short girl, long island. 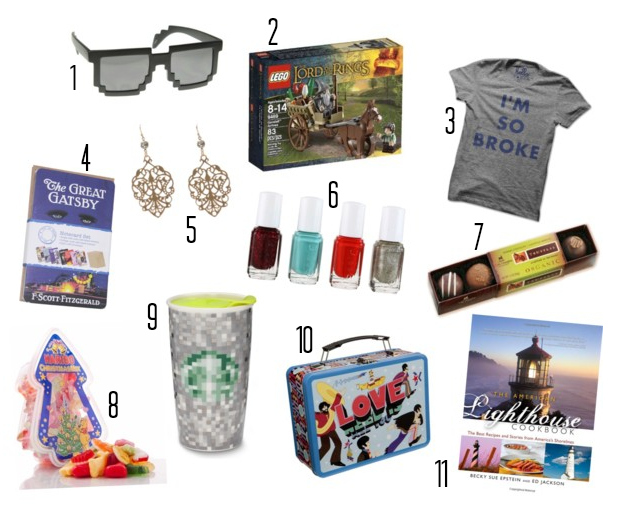 : Gift Guide: Under $20. Tis the season for giving! In order to stay within budget [especially for Secret Santa, holiday blog swaps + stocking stuffers], I rounded up a few of my favorite items that are under $20 + created a fancy little gift guide. Many of these items include free shipping + some have coupon codes, which means even more moolah saved! 1. Pixelated 8-Bit Sunglasses $2.20 - $2.38 These shades will amuse gamers of all ages, especially those who remember the days of old school Nintendo. 2. LEGO Lord of the Rings - Gandalf Arrives $12.99 With The Hobbit release this month, this is a great gift for those who love the "precious." 3. I'm So Broke T-Shirt $20 [20% off with coupon code HAPPY] This super comfy shirt is wallet-friendly + unisex [order one size smaller for the ladies]. Great for anyone who is paying off those pesky student loans, a struggling artist, or that cute Barista at Starbucks who is constantly complaining that "the man" is keeping them down. 4. Literary Notecard Set $12.50 These notecards are fantastic for bookworms + appreciators of snail mail. Also make excellent gifts for teachers! 5. Filigree Victorian Earrings $22 $16.50 [use code HOLIDAY to snag these for $16.50] Every gal should own a pair of nice chandelier earrings + this pair fits the bill. Plus, they gift wrap all items for free. One less thing you have to do = the best gift you can give yourself. 6. Essie Nail Polish Cube - Winter Collection $17 You can give these all as one gift, or split them up for your gal pals presents + keep one for yourself. Includes the colors Leading Lady, Where's My Chauffeur?, Snap Happy + Beyond Cozy. 7. Lake Champlain Organic Chocolate Truffles $11.50 Five assorted truffles for your loved ones with a sweet tooth. They're also organic, which takes the guilt out of stuffing your face with confections. 8. Haribo Christmas Mix Gummi Candies $11.99 You may have had Haribo gummy products before, but unless you've had the real German ones, you have never truly experienced Haribo [trust me on this one, I grew up as a child eating the real thing - my mom's friend used to bring them home to us + they were the best things on the planet]. German Deli has the Haribo hookup. 9. Starbucks x Rodarte Double Wall Ceramic Traveler $12.95 Fashion house Rodarte teamed up with Starbucks to create this pixellated madness. They also made cute totes + sleeves for your cups, which are also under $20. Check to see if your local Starbucks has this in stock before your order, you'll save a few bucks on shipping. I have this cup + love it - keeps drinks hot + doesn't leak. Pick one up for yourself while you're there. 10. Beatles All You Need is Love Lunchbox $13.99 Perfect gift for Beatlemaniacs. If they don't use it to tote their lunch back + forth to work or class, its sure to sit on their shelf + be a conversation piece. 11. The American Lighthouse Cookbook $19.77 This is really two gifts for the price of one - it has tons of information about lighthouses across the country, plus recipes from the regions. Its great for folks who love lighthouses + iron chefs - its even better if they love lighthouses + cooking! We aren't doing gifts this year since we spent all our holiday money on our vacation! !